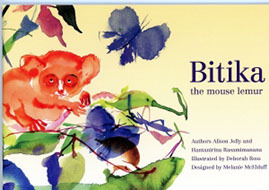 Illustrator Deborah Ross and the late primatologist Dr. Alison Jolly collaborated on a vision: a series of bilingual picture books in which story and science converge. 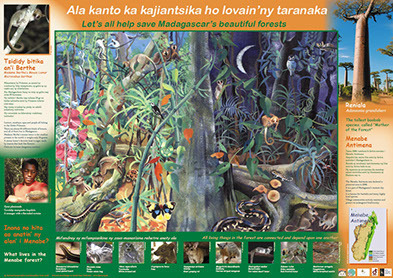 In 2005, LCF published the first title, Ny Aiay Ako (Ako the Aye-Aye), translated into Malagasy by Dr. Hantanirina Rasamimanana. 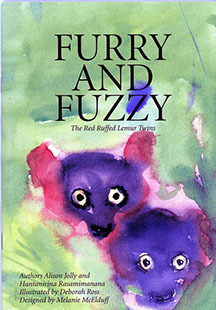 Five books followed, and LCF and the creators provided the books to teachers in the United States, Madagascar, and around the world. 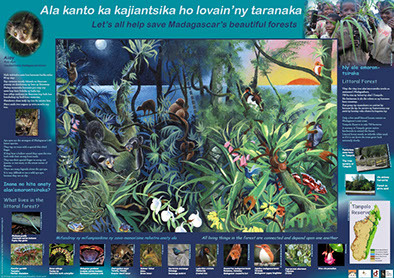 The success of the six-book series led to accompanying posters and teacher materials about different types of lemurs and their fragile habitats in Madagascar. Thanks to funding by Nature’s Path EnviroKidz, the Jolly family, UNICEF, the Liz Claiborne and Art Ortenberg Foundation, the McCrae Conservation and Education Fund, and LCF, the Ako Project has developed into an international environmental education program. 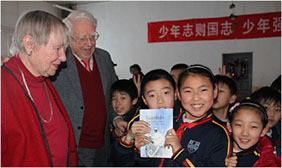 Dr. Alison Jolly pictured with her husband, Sir Richard Jolly, and students sharing their excitement for her picture book Bounce, the White Sifaka. 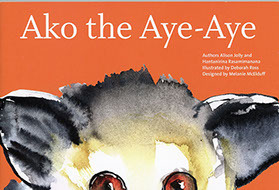 Ako the Aye-Aye (“ako” means “echo”) likes to romp. His species is solitary, so he plays with his food and his mother’s tail. He finds and loses a brown lemur playmate. Finally, he is so busy hanging by his feet that he forgets to be scared of humans. 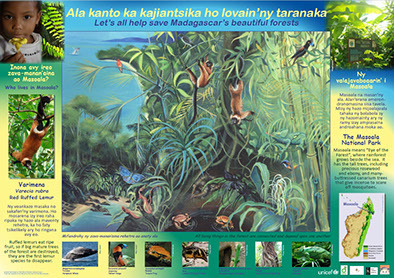 Some Malagasy believe that aye-ayes bring bad luck, but when visitors to the reserve see him playing, they stop being scared too. Bitika the Mouse Lemur is a baby lemur of the smallest species in Madagascar (“bitika” means “tiny”). 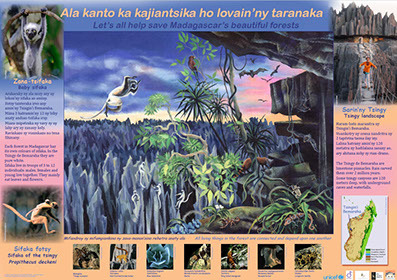 She ventures out of the nest and meets all the larger lemur species of the baobab forest: the chorus is “Bitika felt small.” Then she saves her mother’s life from a white-browed owl. She ends up feeling like the biggest lemur in all Madagascar. Tik-Tik the Ring-tailed Lemur is an adolescent male growing up in a species where females are dominant and young males must emigrate to new troops. “Tik-tik” means “Let’s go!” in ring-tailed lemur sounds. He leaves his mother’s troop to travel alone through the cactus-like spiny forest. Social calls appear in context so children can click, meow, purr, howl, squeak, and sing the male sunset song. 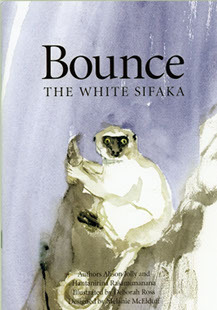 Bounce the White Sifaka is a young sifaka lemur who lives among karst pinnacles, Madagascar’s “stone forest.” He falls down a crevasse, and his family cannot reach him. 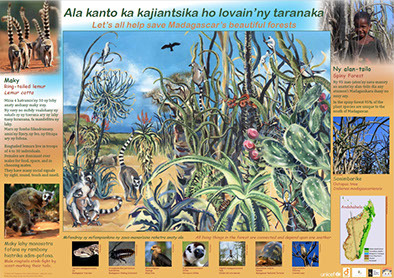 He is frightened by bats, a snake, carnivorous cockroaches, and a fossa, the largest predator of Madagascar. He finally leaps to safety on his mother’s back. 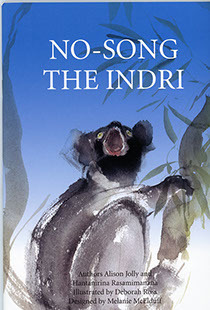 No-Song the Indri lives in highland rainforest. Her family sings beautifully, but she is too young to sing. 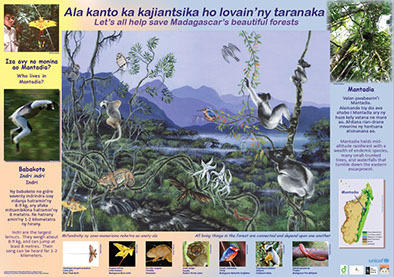 Everything in the forest makes noises: trees, bees, birds, frogs, even a mosquito. Still, No-Song cannot sing. She finally understands what the indri songs mean during a territorial battle, and she at last finds her own voice. 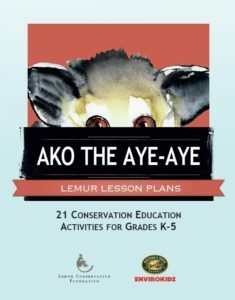 The Ako Lemur Lesson Plans were designed for teachers and zoo educators to be used alongside the Ako book series. The lessons feature characters, themes, and activities related to the stories in the Ako books. Each lesson is aligned with both Florida state and national science education standards. They are intended for children age 5 to 11. 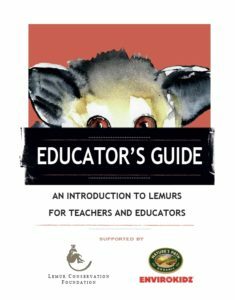 The Ako Educator’s Guide compliments the Ako Lemur Lesson Plans and provides background information about the concepts conveyed to students through the lessons. The lesson plans include activities involving science, math, language arts, physical education, and art. 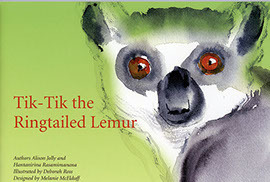 Learn about the different environments of the lemurs featured in the Ako series children’s books. Click below to view or download. 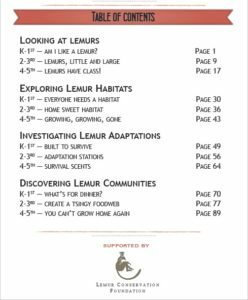 Do you have students eager to read the Ako series books and participate in the Lemur Lesson Plan activities? 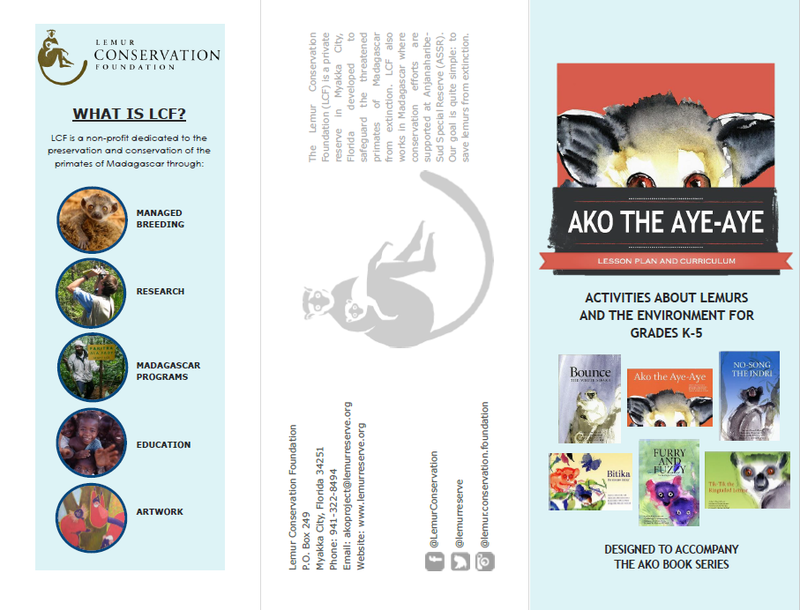 If so, the Ako Conservation Kit is for you! 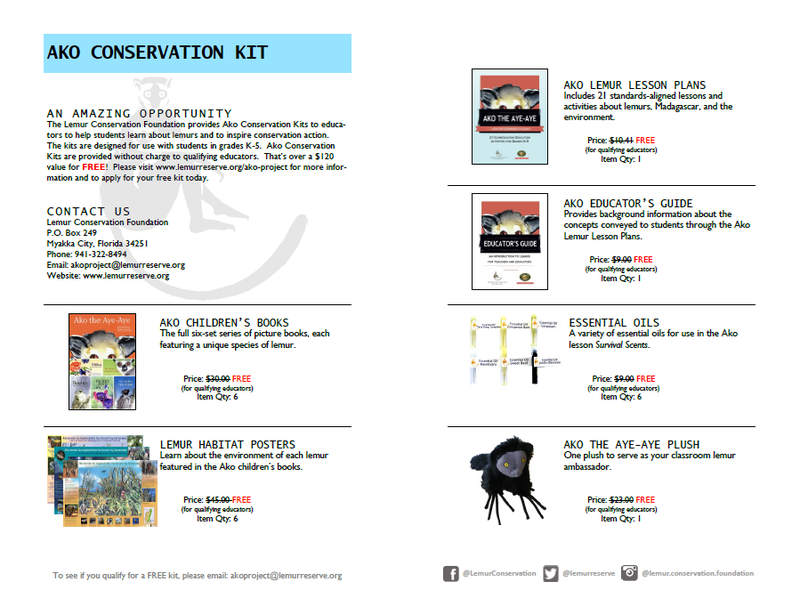 This all-inclusive kit is intended for educational professionals with students ages 5-11. 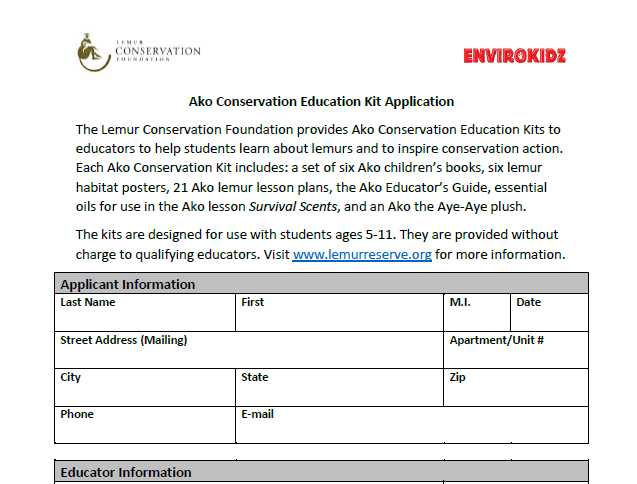 A collaborative effort between Nature’s Path EnviroKidz, the Jolly family, UNICEF, the Liz Claiborne and Art Ortenberg Foundation, and the McCrae Conservation and Education Fund makes it possible to provide each Ako Conservation Kit to qualifying educators absolutely FREE of cost.